Thomas Gibbons Hawkes founded what was probably this country’s most successful factory devoted exclusively to the cutting of glass. It certainly had the longest period of operation of any cutting shop — 82 years. Only fully-featured glassworks — ones that included blank-making as well as glass-cutting — had greater longevities. There were two of these — the New England/Libbey and the Mt. Washington/Pairpoint companies. Hawkes had been foreman of the cutting shop of J. Hoare & Company, having joined that firm when it was known as Hoare & Dailey and located in Brooklyn, NY, soon after his arrival in this country from Ireland in 1863. He was born at his father’s estate, Surmount House, County Cork, in 1846. Although Spillman (1996) and Sinclaire and Spillman (1997), whose accounts of Hawkes — the man and his company — were used to assemble this summary, trace the Hawkes family’s presence in Ireland to an ancestor who migrated from England in the seventeenth century, according to genealogical information on the Internet where it is said that he “left behind another branch [of the family that] produced several noted glassmakers in the nineteenth century”. This is an allusion to Thomas Hawkes (d.1848) of Dudley, located near Worcester, who, with his brothers, ran a glass factory that was especially successful during the second quarter of the nineteenth century (Hajdamach 1991, pp. 63-79). A firm connection between this branch of the Hawkes family and that of Thomas Gibbons Hawkes has yet to be established, however (note 1). According to the obituary of T. G. Hawkes (where information concerning Thomas Hawkes of Dudley is also given) the family descends directly from Thomas Hawkes of Essex, a martyr of Saxon lineage. In 1726 John Hawkes, a descendant of the martyr, moved to County Cork from Worcestershire and founded Monteen Castle. His eldest son, also named John, eventually inhereted the extensive land-holdings of his father and established Surmount which became the ancestory home of the Hawkes family in Ireland. This John Hawkes (there were several) — Thomas Gibbons’s paternal great grandfather — married twice. He and his second wife had a large family that included a son, Samuel, who married Sarah (Sally) Penrose, a daughter of Samuel and Mary (Randall) Penrose of Waterford. This family is said to have included George and William Penrose (uncle and nephew), the founders, in 1783, of the Waterford Glass House. The exact relationship between Sarah Penrose and the glasshouse owners — who were owners only until 1799 — is not known. She is not mentioned in Warren’s (1981) detailed study of this famous factory. Sarah Penrose was T. G.’s paternal grandmother. T. G. Hawkes’ family, on both sides, belonged to the Ascendancy (a privileged class of Protestant Anglo-Irish businessmen, office-holders, professionals, and land-owners). The family was, as a result, financially secure. Thomas Gibbons was able to undertake two years of civil engineering at Queens College, Cork. There is no evidence that he was, in any substantial way, exposed to the craft of glassmaking prior to his departure from Ireland. When he emigrated he was literate and educated — definitely not the stereotypical nineteenth century Irish immigrant. Hawkes’ training undoubtedly was a factor in the success of his many patented and unpatented designs for cut glass. In addition, he had a well-developed business sense, and it is said that he invested wisely. His company succeeded, even after his death in 1913, when he left an estate valued at about half a million dollars. This was a time when other cutting shops were struggling financially and often faced failure. In 1880 Hawkes left the Hoare firm, which had moved from Brooklyn to Corning, NY in 1868, and set up his own cutting shop in that Steuben County village, after having worked briefly at a Hoare and Dailey branch shop in Rochester, NY. A few years later he signed himself “T. G. Hawkes, Rich Cut Glass Manufacturer, Corning, New York” in a proposal to supply glassware to the White House (Spillman 1989, p. 88). Following several successful years during this period — when the company was known as Hawkes Rich Cut Glass — the firm incorporated as T. G. Hawkes & Company in 1890. This is the designation used in this file. 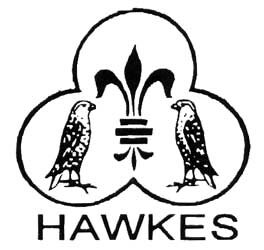 A year before incorporation the Hawkes company displayed its wares at the Universal Exposition in Paris where it won acclaim and a Grand Prize. This event was important for the company and is of particular interest to the present-day collector. In 1903 Hawkes introduced a line of engraved glassware called “Gravic”. It consisted of naturalistic designs, stone-wheel engraved, and usually left in a matte finish. Some elements, particularly leaves, were often cut and polished. Three such patterns were patented, but their names are given in quotation marks in the Hawkes’ Patents file because their exact catalog names have not yet been discovered. The situation is complicated because it appears that the patterns were sometimes called “Satin Engraved” instead of “Gravic” (Spillman 1996, p. 56). Until approximately the First World War these “Gravic” designs were often quite elaborate, and some of the more desirable ones — from a collector’s point-of-view — combined matte engraving with polished, geometric cutting. Later many “Gravic” designs were greatly simplified. 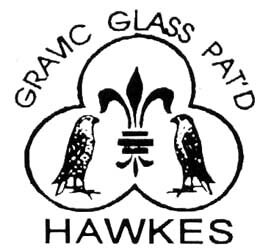 “Gravic” does not necessarily imply a quality piece of Hawkes glass, but it can. Although T. G. Hawkes & Company continued to produce excellent examples of glassware cut in the brilliant style after the turn-of-the-twentieth-century, many of its patterns were merely variations (usually simplified) of nineteenth century designs. Nevertheless, a few of the new patterns were quite original. Patterns such as Queens, Willow, Napoleon, and North Star — to mention only four — are designs that retain their freshness today. Lighter-weight glassware, simply cut or engraved. must have been produced in huge quantities after the First World War, judging from the amount that is found today. This type of glassware has yet to find favor with today’s collectors, although examples that have garnered unusually high prices can sometimes be found at Internet auction sites. Following several years during which the company failed to register a profit, T. G. Hawkes & Company was dissolved in 1962. The earliest Hawkes trademark, shown in advertisements such as these that appeared in Harper’s Magazine, was used only on paper labels, beginning in 1891 and continuing through the decade. The ad on the left (1893) depicts Hawkes’ Fancy Star pattern, which was never patented and previously was thought to date from the end of the decade. The ad on the right (1895) contains the company’s popular Chrysanthemum pattern, patented in 1890. The first acid-etched trademark (below, left), a slight revision of the previous mark, probably was not used until 1902. The gravic glass trademark (below, center) was registered in 1903. It is usually found without the word “Pat’d”, as shown by the actual example (below, right). In addition to the foregoing an interim trademark was in use during 1901, bridging the gap between the use of a trademark on paper labels and that which was eventually acid-etched on the company’s glass. Spillman (1976, p. 146) shows a similar ad that is also dated 1901. T. G. Hawkes & Company sometimes acid-etched the following signature. It is mostly found on twentieth century stemware, but it has also been seen on a cologne whose original sterling silver stopper by Gorham is dated 1899. Several additional sets of catalog pages are available at the Corning Museum of Glass (CMG). f = microfiche. early 1880s: T. G. HAWKES RICH CUT GLASS. Salesman’s cards. With original prices. Spillman 1996, pp. 176-177, 180-181, 184-190.
c1885: T. G. HAWKES RICH CUT GLASS. Salesman’s cards. With original prices. Sinclaire and Spillman 1997, pp. 62-68.
c1895: T. G. HAWKES & CO. With original prices. Sinclaire and Spillman 1997, pp. 73-79. [Compilation Catalog, c1897]: [HAWKES PHOTOGRAPHIC FOLIO II] “Grand Prize Paris Exposition 1889”. An assembled catalog of images from salesmen’s cards published by the American Cut Glass Association in co-operation with the Rakow Library of the Corning Museum of Glass. 2003, lii + 247 pp. Most of the photographic plates date from the early to mid 1890s and are shown in the previous entry (where the images have been cropped). The latest patterns included in this inventory were patented in 1897 (Festoon and Nelson), and, therefore, the publication can not be dated 1890, the date given in the ACGA publication; c1897 is suggested. Pattern and article indexes. No original prices. CMG f-2219C. Additional information can be found in the abernathy1.html file in Part 1.
c1898: HAWKES CUT GLASS. Brochure (first edition), [33 pp.] Limited number of illustrations. No original prices. (Spillman 1996, pp. 147-9, 188, and 194-196). 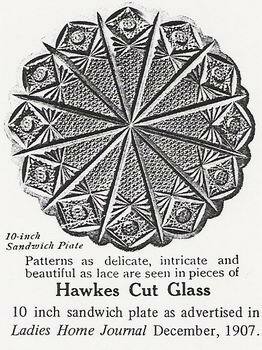 Note: Older Hawkes trademark on p. 21: “Hawkes’ Cut Glass” invariably bears this trade-mark on a label of this size upon each piece.” Listed patterns: Aberdeen, Alpine, Brazilian, Clarence, Coronet, Chrysanthemum, Cobweb, Devonshire, Festoon, Feather, Florence, Grecian, Hobnail, Imperial, Japanese, Lombard, Moscow, Monroe, Nautilus, Norwood, Nelson, Penrose, Princess, Persian, Russian, Roman, Strawberry [Diamond] and Fan, Savoy, Thistle, Valencian, Versailles, Venetian, and Windsor. Only a few of the foregoing are illustrated. In addition there are unidentified geometric and rock crystal patterns unlisted, but illustrated in the text — in one case a geometric pattern on a tantalus. Printed by “Press of the Procter & Collier Co., 315 Walnut Street, Cincinnati. CMG R-792b. 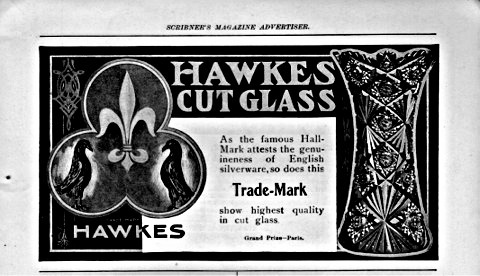 c1901: HAWKES CUT GLASS. Brochure (second edition), [32 pp.] Limited number of illustrations. No original prices. (Spillman 1996, pp. 147-9 and p. 188). 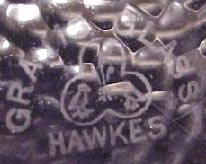 Note: Newer Hawkes trademark on p. 21: “Hawkes’ Cut Glass” invariably bears this trade-mark engraved on each piece.” Listed patterns: Argyle, Berkshire, Brazilian, Brunswick, Cambridge, Chrysanthemum, Cyprus, Devonshire, Empress, Fancy Prisms, Festoon, Gladys, Glencoe, Hobnail, Holland, Kensington, Kimberley, Lorraine, Madison, Navarre, Nautilus, Oriental, Portland, Roman, Russian, Strawberry [Diamond] and Fan, Thistle, Tunis, Versailles, Washington, Yeddo. Only a few of the foregoing are illustrated. Note that pattern B and two versions of the Odd pattern are illustrated but have not been included in this list. Also, there is one unidentifed pattern on a knife rest, and one “rock crystal” pattern. CMG F-254. [Compilation Catalog, c1902]: [HAWKES PHOTOGRAPHIC FOLIO I] “Grand Prize Paris Exposition 1889”. An assembled catalog of images from salesmen’s cards published by the American Cut Glass Association in co-operation with the Corning Museum of Glass. No prices given. , vii + 220 pp. CMG f-2958C. Should probably be dated slightly later. The ACGA used the same cover and frontispiece for both this folio and the similar compilation it published later (2003). There is no title page in either publication. c1905 (with some illustrations, not identified, that are earlier): With original prices. Sinclaire and Spillman 1997, pp. 80-85.
c1911: No original prices. Sinclaire and Spillman 1997, pp. 86-92.
c1913: No original prices. Spillman 1996, pp. 197-200.
c1915: No original prices. Sinclaire and Spillman 1997, pp. 92-99.
early 1910s: With original prices. Spillman 1996, pp. 201-204.
mid 1910s: With original prices. Spillman 1996, pp. 205-213.
c1920-c1935: No original prices. Sinclaire and Spillman 1997, pp. 106-117.
c1925-c1935: A few original prices given. Sinclaire and Spillman, pp. 1997, pp. 100-106. 1. The writer is indebted to Greg Young who drew his attention to the Hawkes family homepage and genealogy that once existed on the Internet and which have been used in this summary. Additional references, not consulted, include the following: Burke’s THE LANDED GENTRY OF IRELAND, pp. 359-360; Hakes 1896: LANDMARKS OF STEUBEN COUNTRY, pp. 48-51; and the Genealogical Bulletin of the Adams Hawkes Family Association, Apr 1988, pp. 1-2. It is worth mentioning that T. G. Hawkes had a younger brother — only two years younger — named Devonshire Hawkes (1848-1931). It probably was he who was honored by the naming of the Devonshire pattern by his brother in the late 1890s although Devonshire, as a family name, was also used earlier. Another brother was John Pim Penrose Hawkes. His son, who had the same name as his father, and who was known as Penrose, emigrated and joined the Hawkes company at the behest of his first cousin, Samuel Hawkes, who had taken over the running of the company upon the death of his father, Thomas Gibbons Hawkes, in 1913. Penrose Hawkes (1900-1972) eventually ran a retail outlet in Corning for Hawkes glass after the company closed in 1962. Penrose was also used as a pattern-name. As mentioned in the main text, it too was a family name of long-standing. Lombard, a third such pattern-name, was the middle name of one of Thomas Gibbons Hawkes’ sisters, Elizabeth Lombard Hawkes. Townsend deMoleyns Hawkes, a first cousin of Thomas Gibbons’, designed a French salad-dressing bottle (pat. no. 46,500) for the company and was its vice-president and secretary from 1914 until his death in 1944.